KWV have been making excellent wines in recent years, the Mentors range in particular, and their exceptional Cape Blend ‘Abraham Perold Tributum’. The Classic Collection is, I believe, their entry level label. But the Pinotage doesn’t disappoint. It’s bright in the glass with medium colour. Made in a modern style, clean as a whistle with fresh spicy fruit flavours and very drinkable. 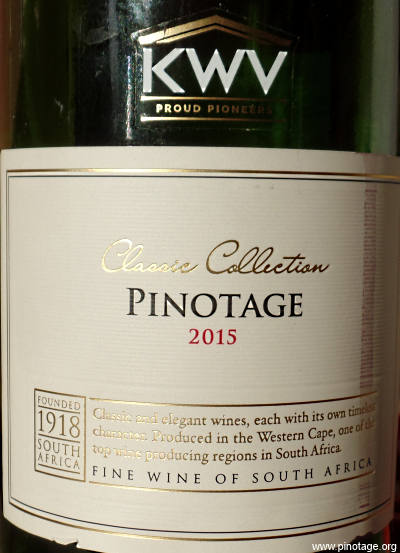 An everyday Pinotage at a very competitive price. Closed with cork. Oak Mountain Winery grows and makes Pinotage in California’s Temecula Valley. I was last in Temecula in 2002 and there’s been a lot of development and new wineries since then, with around forty-eight now in the valley. 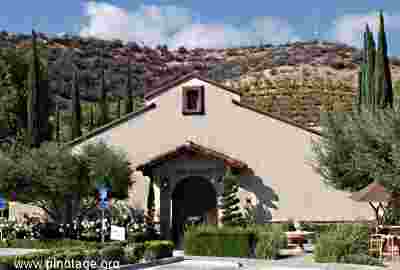 Temecula is roughly midway between southern Los Angeles and San Diego, just off interstate highway 15. Oak Mountain opened in 2005. 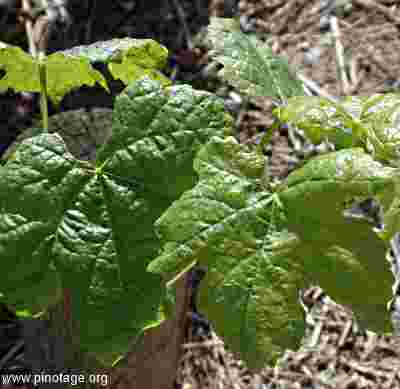 They grow an interesting selection of varieties, mostly Mediterranean and the one that most interested me – Pinotage. 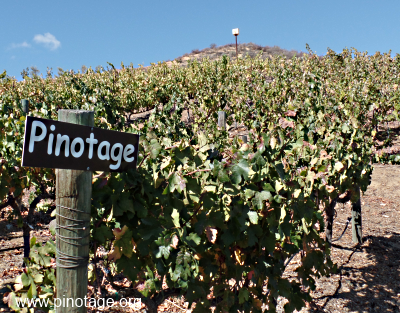 The original Pinotage vineyard of about .7 acres runs up the hill from the entrance, but such is demand that they have just grafted over an acre of Counoise vines to Pinotage. 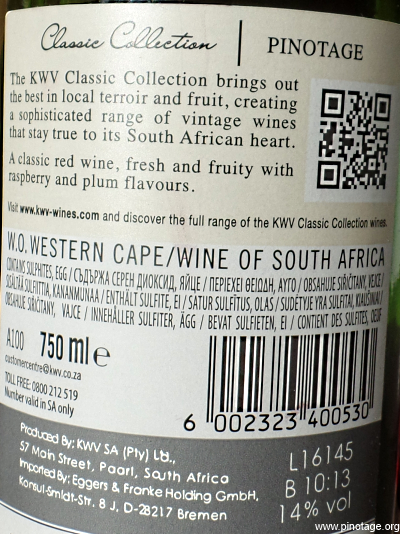 Seems South African ex-pats buy it the entire output of Pinotage the moment it’s released to hoard and age it. The new Pinotage vineyard that used to be Counoise. Temecula Valley is about 22 miles from the coast and sea breezes roll in through the ‘Rainbow Gap’ in coastal mountains between 16:30 and 17:00 to cool these desert vineyards at around 200ft above sea level. 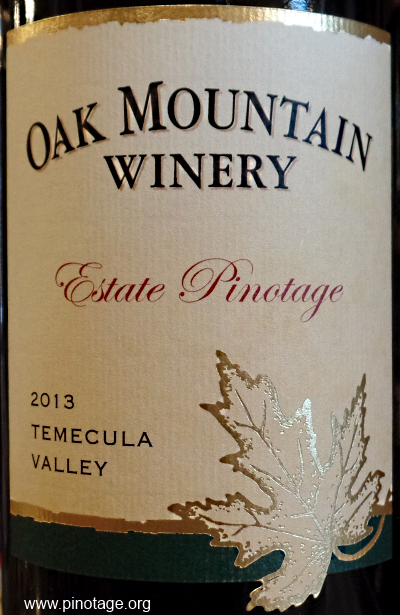 Oak Mountain vineyards are irrigated – these are desert conditions – but they stop irrigation after véraison to stress the vines. Harvest takes place at night time to gather grapes when cool and all grapes go to a sorting table. 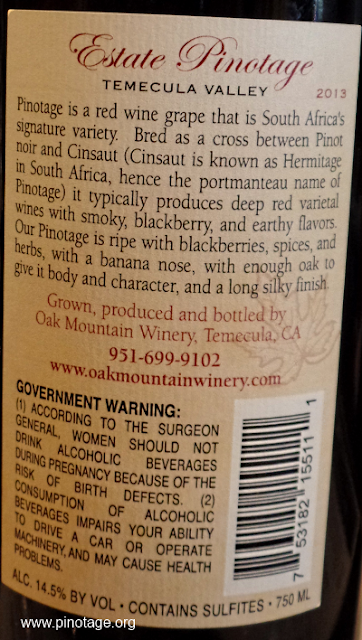 Oak Mountain Pinotage spends 18 months in a mix of 60 gallon (225 litre) barrels, then is blended in tank before bottling. It’s usually released a month after bottling. 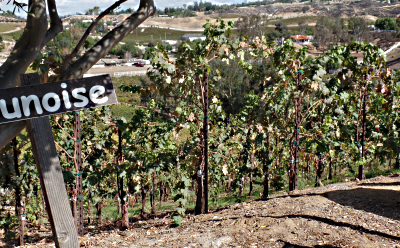 Oak Mountain are the only winery in Temecula to have an underground cellar. They bored into the hillside behind the winery for almost 6 months, stopping only when they hit sand. The cave covers 10,000 feet and later surveys have shown they could double it. 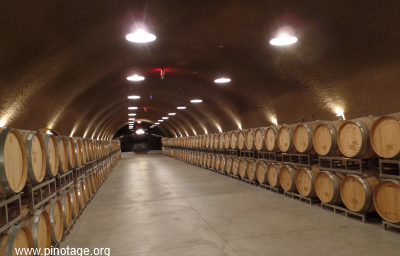 The original intention was as a barrel aging cellar but they get 5-600 visitors every weekend and also rent out the cellar for weddings and functions so the cellar is more profitable as an event space and thus most barrels are aged at Temecula Hills winery which is under the same ownership. 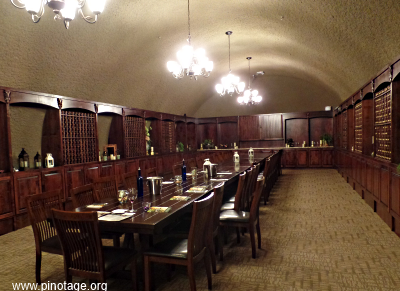 The Cave Tour at $30 takes you into the cellar and includes a tutored tasting around the large table in the impressive board room in the cellar, but it includes an extended sales pitch for their wine club. Cape Wine Master Ginette de Fleuriot looks at 'coffee' Pinotage in her column in CityLife. She discusses how the coffee'n'chocolate flavour was invented by winemaker Bertus Flourie at Diemersfontein, and his latest project and also suggest some other coffee Pinotages.